Noteflight has launched a brand new Help Center that allows customers to easily find the answers they need. The topic-specific categories, search bar, and contact form are there so every Noteflight user can instantly find what they’re looking for all in one comprehensive platform. 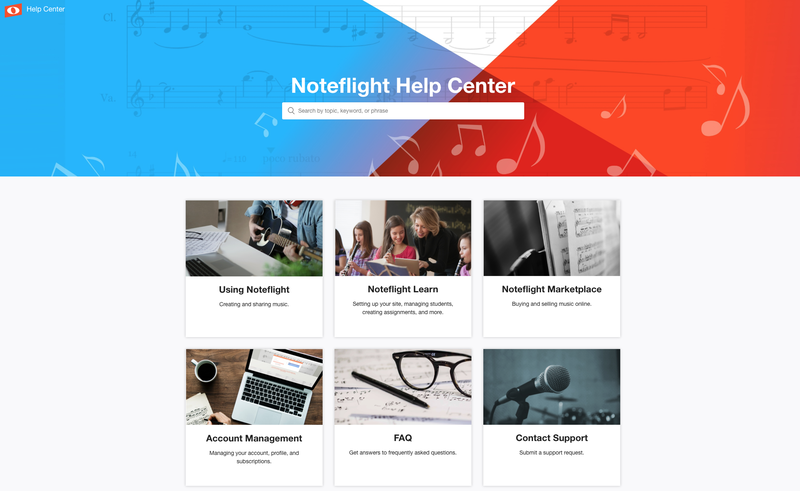 The new Help Center is split into four sections: Using Noteflight, Noteflight Learn, Noteflight Marketplace, and Account Management. There is also a section for frequently asked questions (FAQ) and a brand new contact form that goes directly to the Noteflight Support Team with your questions and customer information. The Using Noteflight section gives users an overview of how to set up a Noteflight profile page, how a user can engage with the Noteflight community, including sharing music and joining groups, and of course a guide on how to use the editor to create music. Any questions a customer might have about getting started with Noteflight can be answered in the Using Noteflight section. The Noteflight Learn section is where teachers can find out how to set up a private Noteflight Learn site, manage users, how to use and purchase content libraries, any questions regarding billing, guides on how to create assignments and worksheets, and Noteflight Learn professional development tips. The Noteflight Marketplace section goes into all of the details on how to buy and sell music on Noteflight Marketplace including signing up to become a seller. The Account Management section is where customers can go to compare Noteflight subscription plans, answer questions about updating their account, such as changing their usernames and passwords, request a refund and more.